Graeme Henkelman is a professor of chemistry at University of Texas and Keith Promislow is a professor of mathematics at Michigan State University. Together they organized the long program Materials for a Sustainable Energy Future in fall 2013. We caught up with them in between workshops. Graeme Henkelman (GH): I’m a computational chemist and materials scientist. Keith Promislow (KP): I’m a mathematician who’s interested in materials science aspects of polymer electrolyte membranes. How were you drawn into these fields? KP: I’ve always been the sort of guy who sits and studies the drops of water that bead up and roll off of Tupperware. Not every mathematician does that. So I’ve always had a lot of physical intuition and I’ve always thought physically. But then I was trained rather purely as a mathematician. Now I’m slowly coming drifting back to the things that originally animated my interest. More specifically, when I was in Vancouver, I talked with an engineer from Ballard Power Systems [a designer and manufacturer of fuel cells] and I realized that were things I could contribute to the problems they were working on. That led me down a decade-long path of studying the issues that arise in functionalized polymer membranes. GH: I started in physics and then got interested in the computational side. If you do computational physics, there are far more applied rather than purely theoretical problems, so computational chemistry was a good fit. As far as how my interests moved towards mathematics, I really just like developing algorithms and thinking about how you get computers to do new things. What qualities do you look for in a student? GH: Students who come to me are usually already enrolled in a chemistry program, so I’m looking to see if they have some interest or skill in physics and math. 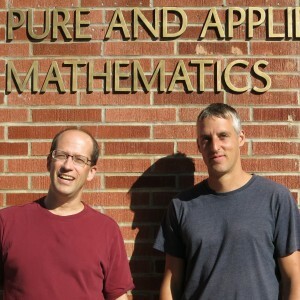 KP: The students who come to me are mathematicians, so I want to know if they have some physical intuition. I want them to be able to connect what they are doing with equations with the real world — what they see with their eyes. You have both been at IPAM programs in the past. What made you come together and organize a long program [Materials for a Sustainable Energy Future]? GH: Here at IPAM you get a chance to talk at a high level with people. What I mean is this. Most of the talks are not about the little details that you always talk about with people in your own field. If you think of most of the conferences or workshops you go to, you are in a little sub-group where everyone does something very specialized and it’s very small scale what you’re talking about. That’s good, and you need to do that, but every once in a while you have to try to figure out how to collaborate with someone who speaks a different language and has a totally different expertise. And you’re not going to find them at that specialized workshop. IPAM is the place to do that kind of thing. The talks are more relaxed and not focused on little details. And you have time between the talks to just sit and think and talk to other people. It’s also particularly nice that there are lots of junior people here, because when you get an idea with someone else, you can get a critical mass of people to work on it right away. Usually when you are at a meeting and you talk about an idea, you might think, “great, let’s work on this”, but then you go back to your home institution and talk about it separately with your graduate students, and it’s much more difficult. Here it’s fantastic: all the students talk to each other and they go to lunch together every day. It’s easy to get a bunch of people working on a project. KP: When I’m back at my home department, I’m in a different frame of mind. While I have connections with the chemists there — I go to group meetings and so on — I see chemists and physicists every day here, and when someone asks you a question, you know you’re going to see them the next day. So it changes my perception of the value I add; I ask myself, “Did I help them solve their problem?” You’re not going to get that kind of interaction sitting in your home department, where you just get little snippets of interaction. It’s not enough! You need the long stretches of time you get here at IPAM. Also, during the long program Navigating Chemical Compound Space, we started a project on alchemical derivatives with Anatole von Lilienfeld. [Paper: Alchemical derivatives of reaction energies.] If you change the atoms in some molecule, how would it affect a property like the catalytic activity? You try to take that derivative. This is something you can do with our quantum chemistry codes, that’s something that we worked out, and we’re using that kind of mathematics to optimize structures for catalytic activity. And ever since I’ve been coming to IPAM, the subject of accelerated dynamics has been a strong theme here and in my research. This is a very good topic for connecting chemistry and mathematics; it’s a very mathy problem but it’s also a fundamental problem in chemistry. Not just my group but several other groups in chemistry have linked up with mathematicians at IPAM over this subject. KP: The thing that’s resonating the strongest with me right now is the saddle-point-finding problem that Graeme’s group is working on. It’s the kind of problem that, from a mathematical viewpoint, you can imagine doing something that could be really useful. KP: It’s hard to pick a favorite. If someone outside of math wanted to look at what we’re doing, I’d point them to my paper Variational models of network formation and ion transport: applications to perfluorosulfonate ionomer membranes in Polymers. GH: I don’t know if it’s my favorite, but of my work on these transition-state finding methods, the most widely used is the climbing image nudged elastic band method.